You are here: Home > Blog > Pests & Diseases > Stick and flick, a possible solution to dog mess in woodlands? 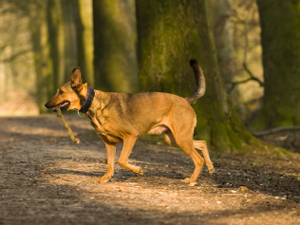 Dog mess has been a long-term problem in woodlands. As dog owners have been forced to clean up after their dogs in parks and streets over the last 15 years or so they have not always been so good at "picking up" in public woodlands or on footpaths in private woodlands. This could be because dog owners don't feel a need to clear up in "the great outdoors" or it could be that some people feel they are not being watched and can "get away with" leaving the dog's doings. A more charitable view is that in woodlands people leave their dogs to roam more widely and dog mess * left without the owner seeing what has been done or indeed exactly where it was done. Recently several organisations have been working on a half-way house to solve the problem of dog mess in woodlands - stick and flick. The idea is that the one thing that is widely available in woods is sticks and the main objective is to stop people treading in dog mess. So dog-owning visitors to woodlands are encouraged, mostly by signs with rather graphic images, to take a stick and flick the offending deposit into the bushes or undergrowth where it will decay naturally. You use a stick and a flick. Sounds easy, but does it work? Objectors to the scheme point out that even with "stick and flick" the dog mess is still right next to the footpath where people readily wander off the path and it can also create an unpleasant smell for some time. They also point out that the solution can be rather incomplete and some of the problem remains and people have varied and different ideas about what it means to be totally off the path. Against that, it is surely better to have some wholesome biodegradation rather than what one often sees in woodlands - black dogmess bags thrown into the bushes and hanging there for weeks or even months. Stick and Flick seems to be endorsed by the Forestry Commission who ask people to use this technique when they visit Delamere Forest Park - they even have a poem about the scheme on their website which concludes with the words, "Find a stick; pick a spot, flick into the bushes so it can rot." They do, however, still ask visitors to pick up properly near the Forest Centre buildings and at the car parks. Other large organisations are following suit and the National Trust at Ashridge in the Chilterns are advocating a stick and flick solution to dog fouling on the footpaths as are the Woodland Trust in some of their Nature reserves. I work for a small charity who own a new woodland – planted about 10 years ago. It is open to the public and attracts many dog walkers. Our organisation can not endorse the stick and flick approach because our woodland needs frequent and active management during these formative years – checking the tree guards, pruning the fruit trees and coppicing by rotation many of the trees, as well as strimming the edges of the paths for the benefit of walkers.. The staff and volunteer who do this management work do not want to encounter dog mess that has been removed from the paths by stick. For us taking mess off site or placing it in the bins we provide (at a cost to the charity) is the only way. However, we do not have the resources to police this so sadly we suffer because many dog owners do not do the right thing. I think this a disgraceful idea if people can’t be bothered to be responsible dog owners don’t have a dog. This idea is being used as an excuse in other places not to pick up. In a private woodland who are you expecting to pay for and to empty the dog poo bins. Could you but a bin in your front garden please so I can leave my s**t in it. Or maybe I should just stick and flick it to the edge of your front drive? I imagine that doesn’t sound too good and fair to the self centred dog owners out there. Engage brain… We don’t all love dogs and their s**t! I bought my wood to enjoy the wildlife and the trees and plants, to manage it so that it becomes more diverse and is home to more species, not to be overrun by dogs and their (usually) self-centred owners. Dog poo increases the fertility of the soil, and (in some cases) what we are after is the exact opposite. Lower fertility increases biodiversity. Those of us who own and maintain woods actually have to pick things up off the ground and I, for one, don’t really enjoy picking up or getting covered in dog s**t.
I didn’t pay well over £100,000 just for somewhere that people, I don’t even know, could walk their dogs and let them chase the wildlife. Not everyone loves / likes dogs. I and many others are fed up with people who just will not take any responsibility for their own or their dogs actions. It’s the new cult of the dog… First get your gas plasma TV then maybe the big car and the 2.4 kids. Then get a dog. It makes you so normal (not). If you want to go for a walk and see some interesting wild life… THEN LEAVE THE DOG BEHIND. You’ll see a lot more of interest. All this talk of my dog eats good food and its poo doesn’t smell is not only missing the point completely, its absolute BS. Dog s**t is unpleasant. If you must have a dog then take responsibility for it in every way. I’ve taken to ‘being seen to shoot’ near dogs, not on leads, that are roaming free and worrying the wildlife in my woodland. The owners tend to get the message and don’t seem to return. It may sound unfriendly/dangerous/mean etc. but I really don’t want loads of dog walkers and their mutts ruining my enjoyment of my haven. Plenty of Private Woodland signs displayed but of course many feel that PRIVATE woodland is a free for all, like the park or the beach or a heath… It’s not. Someone owns it, maintains it and pays for that work or does it themselves. Their selfish behaviour is spoiling things for us all, in particular for woodland owners who don’t want the relentless presence of dogs in their woods as well as virtually everywhere else, as it seems to be these days. The problem is that, for what ever reason, many dog owners are either too lazy, selfish or sqeemish to pick up their dog’s poo, or just plain demented having bought bags, used bags, then chucked bags. I’d love to catch someone in the act and interrogate them. It is actually quite difficult to flick dog poo any distance, and when very soft or runny, even more so. There is a third way. Wear wellie boots and convert the poo rugby style. Think Jonny Wilkinson. Yes there will sometimes be residue on the boot, but that quickly gets washed off in long, wet grass or plants. The poo is also blasted so disintegrates and more quickly biodegrades. Wellies are the very best S… Kickers. And nobody will ever know that you and your dog have passed that way. Your boots will be pristine when you jump in your car to drive home, or if you’re one of the squeemish, just polybag the boots and jump into a pair of slip-ons. While I appreciate an attempt to reduce laziness from dog owners who just leave poo bags strewn around (why oh why when you’ve gone to the effort of picking it up) please spare a thought for toddlers and young children who spend their walks looking for the perfect stick. This ill conceived solution means parents not only have to be as vigilant as ever when children go exploring in the forests but also now have to make sure the sticks they pick up don’t have dog poo on them. What better way to raise the risk of young children getting dog poo in or around their eyes than by suggesting that (lazy) dog owners use (hunted for and eagerly grabbed) sticks to swipe dog poo away. We went there with last weekend for the first time and as responsible owners we picked up our dogs mess (even though he did it off path)and carried it for over an hour with us hoping there would be a bin back at the car park. Unfortunately for us there wasn’t so we ended up putting it into the boot of our car and driving for an hour home and putting it into our own bin. Maybe we would have been better off throwing the bag (biodegradable) into the thick bush area and let nature take it’s course, but that felt irresponsible. I have two rehomed dogs, and always collect their mess in bags and take it home. I am totally opposed to this stock and flick policy, on any public access land. I have just returned from FC Cardinham woods, where I saw 4 piles of dog poo, and two dumped bags of dog poo by a path. Take your dog’s mess home with you, why should someone else pay for it to be dealt with and collected? My solution, a dog permit payable to the landowner, say £25/year. The FC charges permits for horse riding, why not dog walking? If you want to take your doggies onto public access land, WT, NT, FC or local authority etc, I suggest a voluntary dog permit. The proceeds then to go to the landowner, who can then manage the issues of dog poo disposal, and anything else. It could also be a way of enforcing compliance with a doggy policy, whatever that might be. One problem I find is not aggressive dogs, but aggressive dog owners, who walk their dogs off lead in the country, but don’t want them to meet or play with other dogs. If you don’t want your dog to meet other dogs, then don’t take them into busy public areas with other dogs! Take them on a lead elsewhere, away from other dogs. 29/5/16, Bodmin. For anyone that works on the ground in forest/parks this is an ongoing problem. When the time comes to maintain the footpaths by strimming it is one of if not the worst thing to find when strimming, it is also very dangerous should it come into contact with your eyes! Even if dog owners ‘stick and flick’ it’s still in the places where we have to strim. The best solution is to either keep your dog on a lead around public buildings/parks so you know exactly when your dog has been to the toilet or pick it up in a bag and actually carry it with you and dispose of properly instead of throwing it into a hedge or tree for everyone to see! All dog mess should be picked up (not merely sticked and flicked) because, surprisingly, people like to wander off the paths as well. Treading in rabbit poo and the like is nothing compared with the soft, sticky, stinking, copious faeces produced by the average pet dog. And what happens to the stick when it has been used to flick? Is it dropped on the path for a child to pick up or (hopefully) for another dog owner to pick it up and grab the wrong end? I am surprised that the National Trust (to mention another organisation) is endorsing stick and flick and is complaining about the cost of the dog poo bins recently installed (at the request of dog owners) on the Ashridge Estate (“Following requests from our visitors we have recently installed four dog waste bins near the visitor centre. In a year these bins will cost the same as looking after half of our ancient trees. This is a considerable cost to the estate and may be reviewed in future.”) The obvious answer is to levy a charge per dog per walk for members and non-members alike – which will have the added bonus of cutting down on the number of dogs on their estates (most of which will be walked daily by card-carrying members, I suspect). Another answer might be to make dog walking on various estates conditional upon dog walkers being made to show that they have biodegradable bags on arrival. This would mean that no-one without bags would be allowed on the estate and even if some low-lifes did leave bags of dog faeces on the nearest tree branch they would, at least, decompose in time. The bags could be sold in shops and visitors’ centres (at a hefty profit) to those who come unprepared. Better still, limit the areas where dogs are allowed so the rest of us don’t spend the day looking at where we’re treading instead of admiring the scenery. Dog owners and their noxious pets have had it their way for far too long. It’s about time that people fought back! Train your dog to go in the bushes out of the way whenever possible – its easy enough to do. My dog only gets top quality dry food – her poo hardly smells at all and is easily picked up or discretely sticked and flicked. Feeding low quality dog food wet food and lots of human food creates messy unhealthy poos. Be a socially responsible dog owner for pooches sake! For now “Stick and Flick” may work in the woodlands. But isn’t dog mess supposed to be enriching the soil as some sort of fertilizer or something? I do feel that animals of all species are likely to defaecate freely in woods and that this is a situation woodland owners and the users of woods must put up with. What I find unacceptable is the use of plastic bags containing canine faeces thrown over the wall into my wood by walkers on the Drove road forming my northern border when stick and flick would be more acceptable. Polythene bags containing faeces are non bio-degradable and for me a significant disposible problem. I use the woodlands for walking and occasionally with my grandchildren. We look at the plant life in the wood and being children they want to pick up things. Sometime I pick up moss for the top of plant pots and to show the children how differently it grows from other plants. I can nolonger do these simple acts because the uncaring selfish action of dog walkers. One of whom is a friend and sees she has no resposibility to clean up after her 3 dogs. If this was someones garden would you treat it the same? I’m out in the woods with my grandchildren, trying to encourage them away from the television & the computer…….and what happens……one steps & slips in dog mess! There’s nothing worse. The above article is not a complete resolution to the problem but it does go some way to helping things. Maybe there are just too many dogs AND too many people or is that just stating the obvious! A far better solution than trying to dispose of plastic bags. The aim of picking up dog mess is trying to avoid human contamination, so flick it out of the way is a great solution. The only problem is where here is too much dog traffic, I guess like round visitor centres and the like. Simple pragmatic message which should be common sense.